Simply translated from Spanish, Lino is the word for linen. When looking over this design, you will be able to note the lines found within your favorite woven textile. Combine that with sparkles to capture all the event lighting and a neutral color that will look like Champagne to Taupe, and you will delight in this simply yet elegant offering. Whether you are planning a corporate event for an awards gala, or throwing together a personal party in your dining room for friends, you will revel in your guests delight over this unique charger that will mix with any color you desire. And don’t forget, our chargers are crafted to be food safe, so you can use them within your design, as well as in your food service. Because of its fragility and weight, contact our experienced design specialists. A crisp apple green, this fantastic charger plate with a wavy, scalloped pattern, will set the tone for your event, and remind all about their favorite flavors. 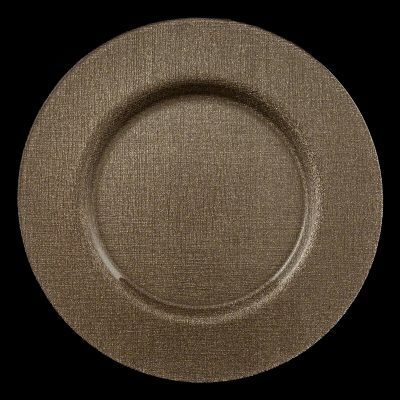 Charger plates are back in a very big way, so be decadent in the way you serve your guests. Traditionally, rented chargers were used as simple placeholders, but due to advancements in the field of glass work, youll find that our plate chargers are completely safe to touch, and you can even eat off them. 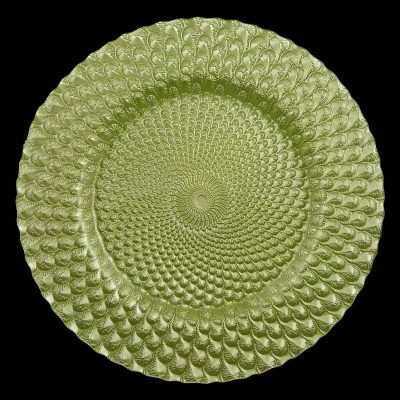 So how would you use our Luxe Citron glass plate charger at your next event? All your wonderful vegetables will be accented in a fabulous way as you create the special table that leave your guests in talking for days. Because of its fragility and weight, contact our experienced design specialists. 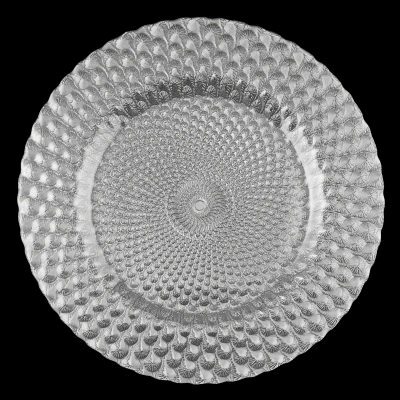 The fabulous green of Oz, this fantastic charger plate with a wavy, scalloped pattern, will set the tone for your event, and remind all about their favorite movie and/or holiday. 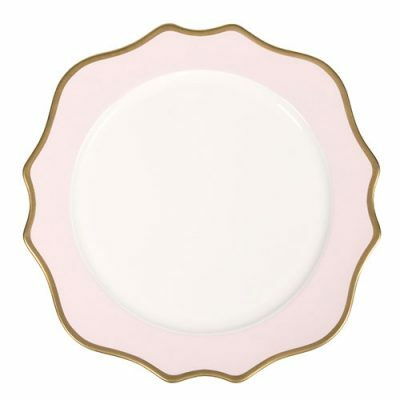 Charger plates are back in a very big way, so be decadent in the way you serve your guests. 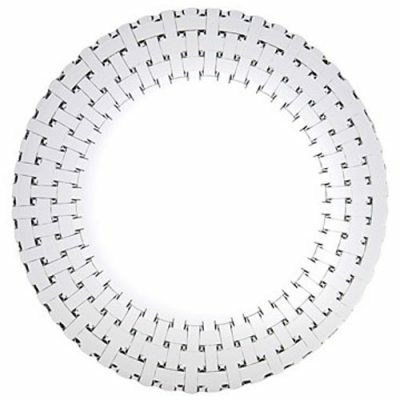 Traditionally, rented chargers were used as simple placeholders, but due to advancements in the field of glass work, youll find that our plate chargers are completely safe to touch, and you can even eat off them. 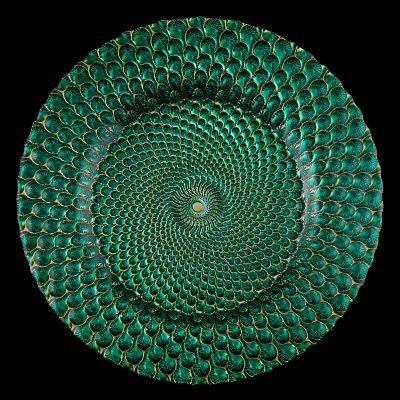 So how would you use our Luxe Emerald Green glass plate charger at your next event? Always a color for holidays, but Emerald is a color that will make your table shine throughout the year! Because of its fragility and weight, contact our experienced design specialists. 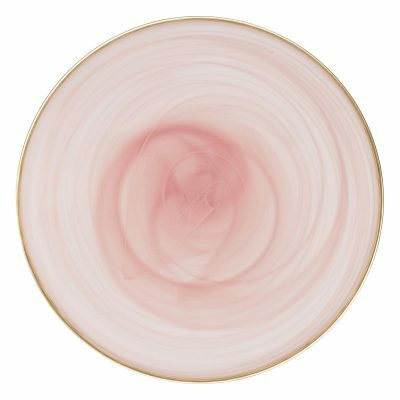 Shimmer meets texture in the elegant Ribbon Rose Gold charger. Lines of delicate pink gold run through the textured background, in a natural, organic shape for an ideal balance of sophistication and unique style. 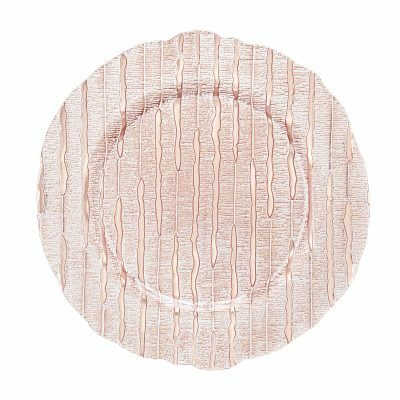 The Ribbon chargers will enhance the appeal with a subtle gleam and shine that will elevate a special event table design. ?And don’t forget, our chargers are crafted to be food safe, so you can use them within your design, as well as in your food service. Because of its fragility and weight, contact our experienced design specialists. Inspired by the southern Spanish city, this design incorporates the modernist views found throughout beautiful Old Town. 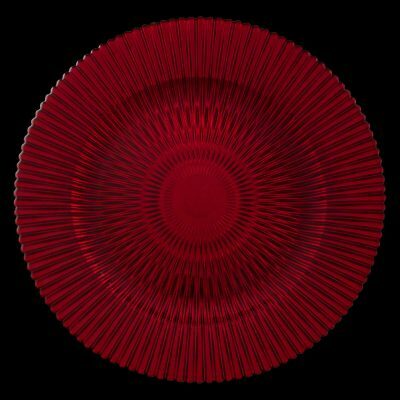 Available in a myriad of fashion forward hues, this deep red hue will add clean lines, while adding a subtle flair to your tabletop décor. And don’t forget, our chargers are crafted to be food safe, so you can use them within your design, as well as in your food service. Because of its fragility and weight, contact our experienced design specialists. a gray in the center of all grays. With the clear center, you can relish in the table linen found underneath, or add a menu to complete your vision. And don’t forget, our chargers are crafted to be food safe, so you can use them within your design, as well as in your food service. Because of its fragility and weight, contact our experienced design specialists. Passed down through the ages, family traditions always covet the Silver pieces found in our familys heritage. Continue the tradition with this Luxe Silver Luster fantastic charger plate with a wavy, scalloped pattern, which will definitely set the tone of your event immediately. 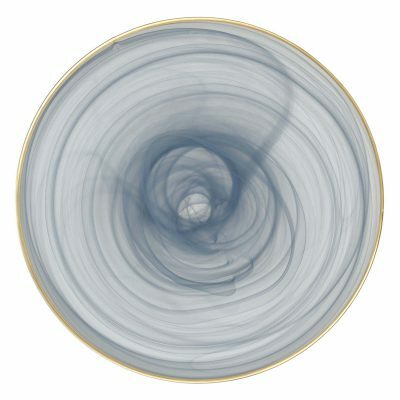 Charger plates are back in a very big way, so be decadent in the way you serve your guests. Traditionally, rented chargers were used as simple placeholders, but due to advancements in the field of glass work, youll find that our plate chargers are completely safe to touch, and you can even eat off them. 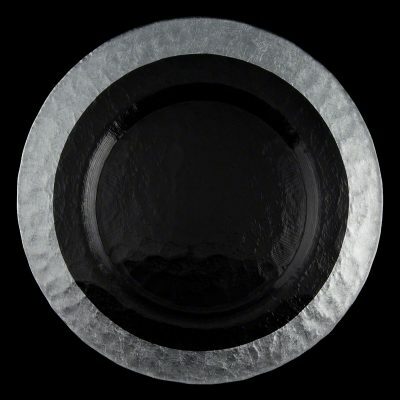 So how would you use our Luxe Silver Luster glass plate charger at your next event? Add them to your buffet, or pass trays for that extra unexpected chic. Because of its fragility and weight, contact our experienced design specialists. If you look up the definition of Reflex, you will discover one of the meanings to be an action that is performed as a response to a stimulus and without conscious thought. When it comes to this charger design, you will automatically respond with a gasp of awe and delight with its sparkling revelry. Our Silver version is a little more in the lighter tones, with a dash of steel, and whole lot of glittery reflective notes. Add the fun from New Years into every other day of the year. And don’t forget, our chargers are crafted to be food safe, so you can use them within your design, as well as in your food service. Because of its fragility and weight, contact our experienced design specialists.